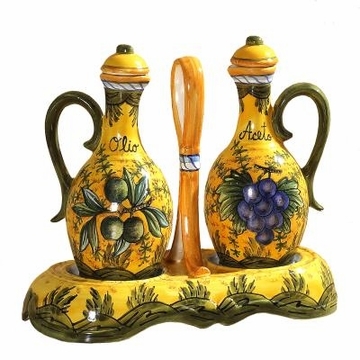 The Olio Olive collection from Intrada Italy features ceramic dishes with an olive theme - reflecting the abundance of olives and olive oil throughout Italy. This collection includes plates, bowls and trays, but focuses on olive oil bottles, cruets and oil and vinegar bottle sets. There are many from which to choose. Each piece is handmade in Italy with incredible craftsmanship. Intrada Italy Olive Plate Square Wave 12.5"
Intrada Italy Olive Plate Wave 10"
Intrada Italy Olive Bowl Wave 9"
Intrada Italy Olive Tray Sectional 12.5"